The Keyman Text Editor is a basic text editor for testing your Keyman keyboards. 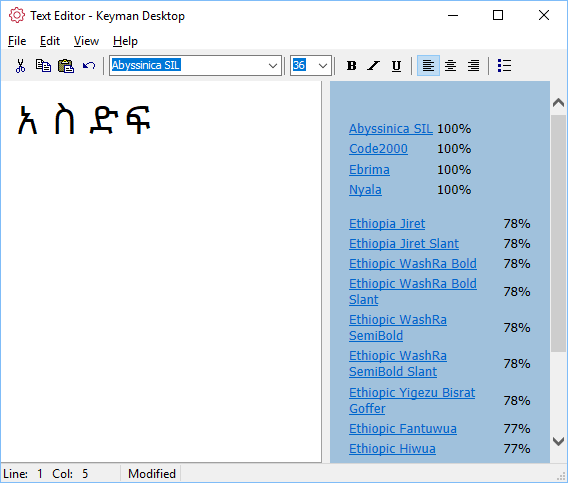 You do not need to use the Keyman Text Editor to type with Keyman Desktop. You can use Keyman Desktop in almost any application on your computer that accepts keyboard input. From the Keyman Desktop menu, select Text Editor…. Turn on a Keyman keyboard. When you select a Unicode Keyman keyboard, the Text Editor brings up a font panel. This font panel behaves like the Font Helper tool in the Keyman Toolbox. Each font listed in the panel includes a percentage value. This value indicates how many characters in the current Keyman keyboard are available from the font. Most of the time, fonts with greater than 90% coverage will work for nearly all texts. You can select a font from the font dropdown menu or by clicking on the link for the font in the font panel.